November 15th is America Recycles Day, a nationally recognized day dedicated to promoting recycling, and buying recycled products. America Recycles Day is easy to celebrate because it takes no preparation. If you’re finished using a product and it is recyclable, then put it in the correct recycling bin—that’s all there is to it! 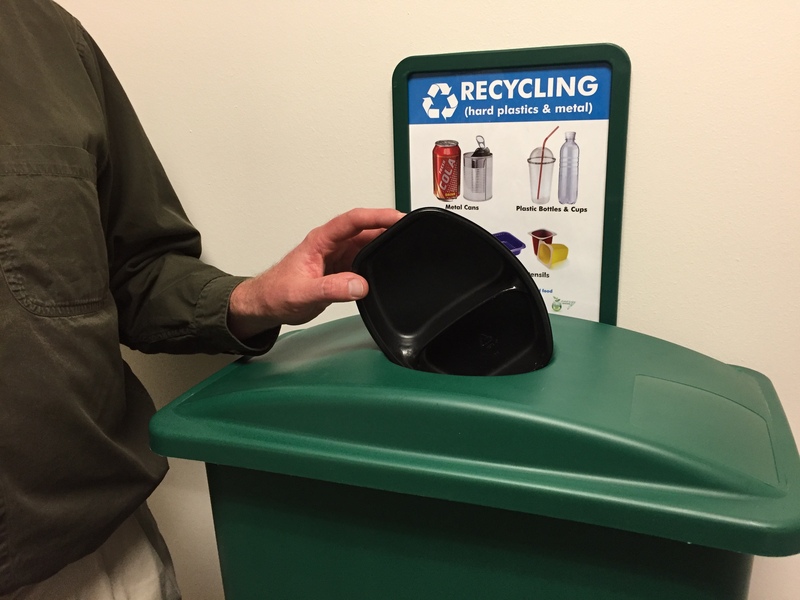 Not sure what to recycle on campus? Watch this short video to find out, or visit our webpage for on-campus information. Check out the Wasteline site for recycling information in and around Omaha. It’s more important than ever Recycle Right! Make sure you recycle items in the correct containers. This reduces contamination, which could send the entire load to the landfill, while ensuring that everything in the bin can be recycled. Don’t be a “wish-cycler”! Wish-cycling is the common, but damaging process of intentionally placing questionable items into a recycling bin, in the hopes it will be recycled. Those of us that care the most about recycling are some of the worst offenders. We desperately want to believe that the item can be recycled or that they will find a way to do so, but it actually creates more problems: sorting machines get clogged or broken, which takes time/money to fix, it’s more time consuming for hand-sorters, and it creates more waste! It also costs us (wastes) an average of $250,000/year. Post-consumer means the material came from the end-user and that material would have otherwise ended up in the landfill, like cans, newspaper, or plastic bottles. Pre-consumer/industrial content is still recycled material, but was produced during the production of another product, e.g. wood chips, sawdust, and glass or metal shavings. Recycled content product diverts materials from the landfill while protecting new or virgin resources, so make sure what you are buying has the highest percentage possible of recycled content. Doing some “fall cleaning” and have items that aren’t meant for the recycling bin? Reusing is always better than recycling! Donate clothing, warm weather gear, and toiletries to people in need, and local charities will take other household items.